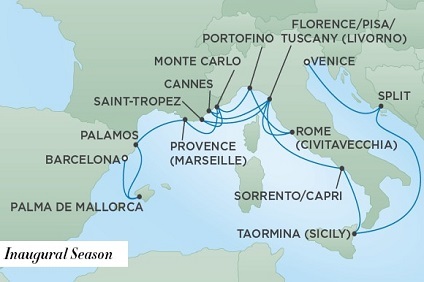 Seven Seas Splendor - luxury perfected. In our pursuit to exceed your expectations, we are creating a work of art, from bow to stern. No expense, no effort and no detail is being spared in the design of our new ship. In the smallest details you will find care and meticulousness, and across opulent restaurants, spacious suites and sumptuous lounges, witness the majesty of expert craftsmanship and excellence in design. Intricate marble patterns and soaring ceilings topped by sparkling chandeliers adorn your path throughout this exquisite ship. These inspired spaces foster a new level of sophisticated ambience that perfectly showcases everything Regent Seven Seas Cruises® has to offer. Wherever you turn, you will be enveloped in timeless elegance, absolute comfort and graceful hospitality, as you set off on journeys to explore awe-inspiring destinations around the world. Your senses will be enchanted by sumptuous décor and unique art that perfectly flow from one area to the next. Similar to how you would happen upon an inviting café on an afternoon stroll, Coffee Connection is one of the spaces that once you discover, you will find yourself returning to again and again. Plus, with our NEW alfresco area, you may even sip your cappuccino while taking in the views. And this is just the beginning. At every turn, Seven Seas Splendor™ exudes excellence, comfort, and grace; the perfect way to arrive at the places you’ve always dreamed of exploring. 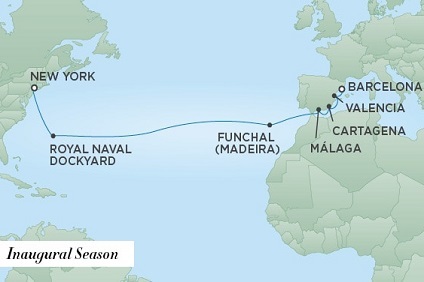 14 Night Cruise sailing from Barcelona to Miami aboard Seven Seas Splendor. 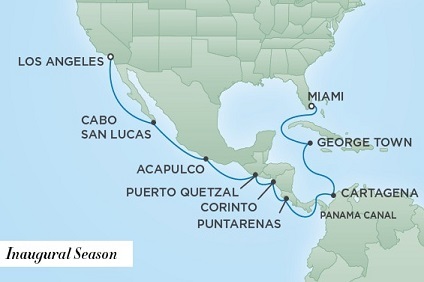 16 Night Cruise sailing from Miami to Los Angeles aboard Seven Seas Splendor. 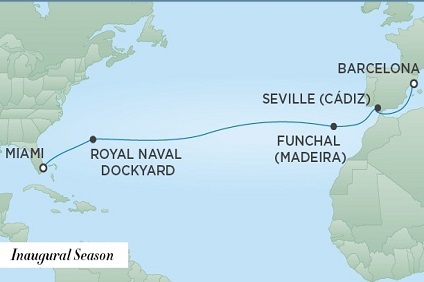 16 Night Cruise sailing from Los Angeles to Miami aboard Seven Seas Splendor. 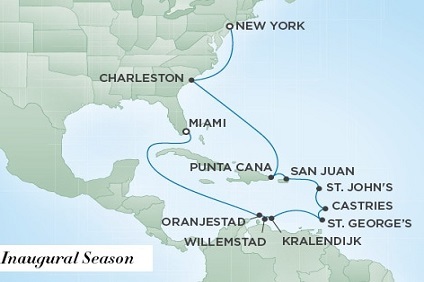 15 Night Cruise sailing from Miami to New York aboard Seven Seas Splendor. 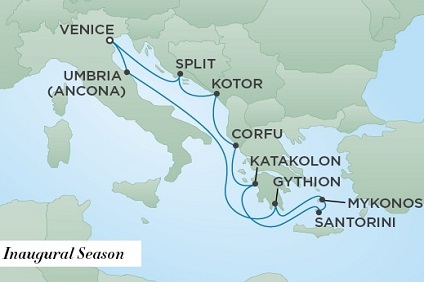 12 Night Cruise sailing from Barcelona to Venice aboard Seven Seas Splendor. 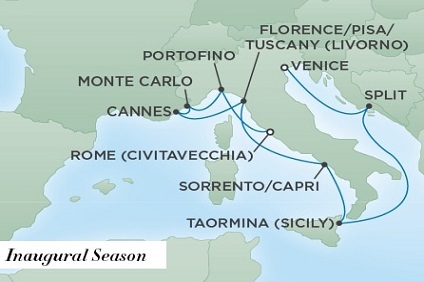 9 Night Cruise sailing from Venice to Rome aboard Seven Seas Splendor. 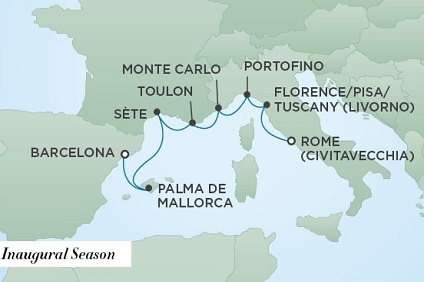 16 Night Cruise sailing from Venice to Barcelona aboard Seven Seas Splendor. 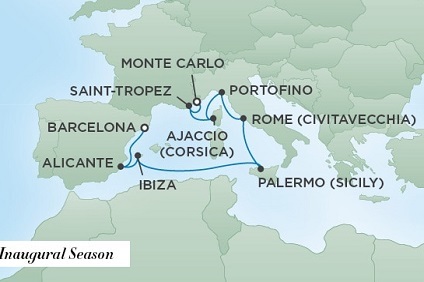 7 Night Cruise sailing from Rome to Barcelona aboard Seven Seas Splendor. 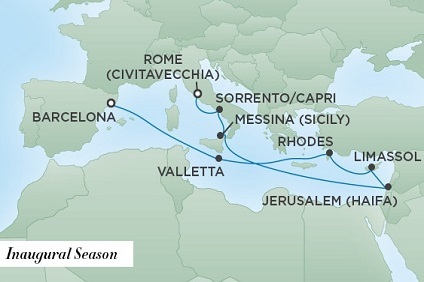 7 Night Cruise sailing from Barcelona to Rome aboard Seven Seas Splendor. 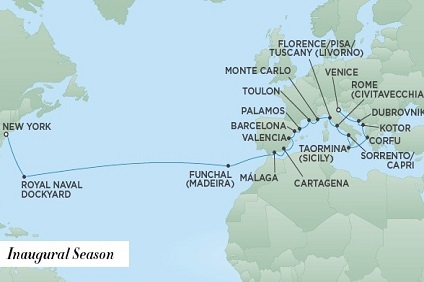 19 Night Cruise sailing from Barcelona roundtrip aboard Seven Seas Splendor. 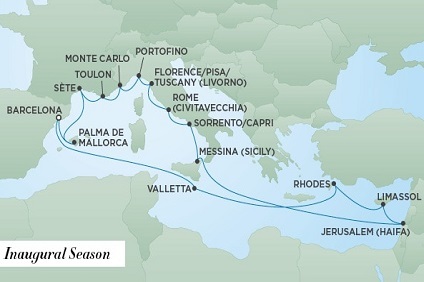 12 Night Cruise sailing from Rome to Barcelona aboard Seven Seas Splendor. 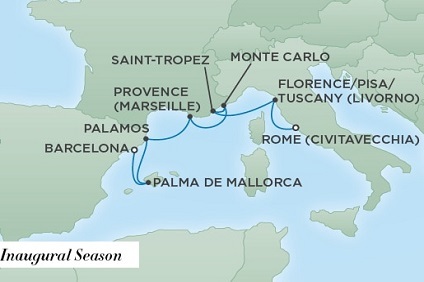 10 Night Cruise sailing from Barcelona to Monte Carlo aboard Seven Seas Splendor. 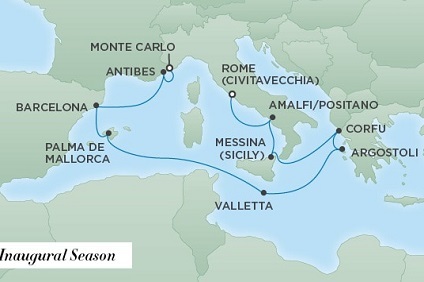 10 Night Cruise sailing from Monte Carlo to Rome aboard Seven Seas Splendor. 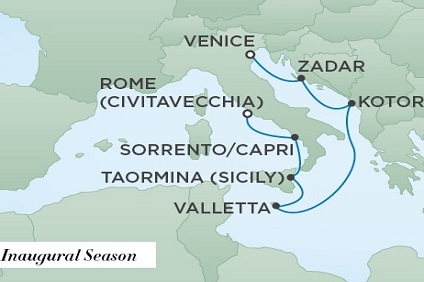 7 Night Cruise sailing from Rome to Venice aboard Seven Seas Splendor. 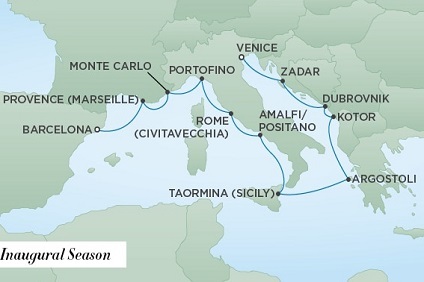 17 Night Cruise sailing from Rome to Venice aboard Seven Seas Splendor. 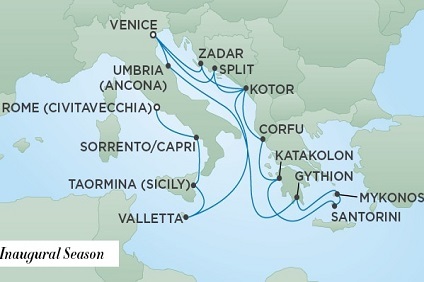 10 Night Cruise sailing from Venice roundtrip aboard Seven Seas Splendor. 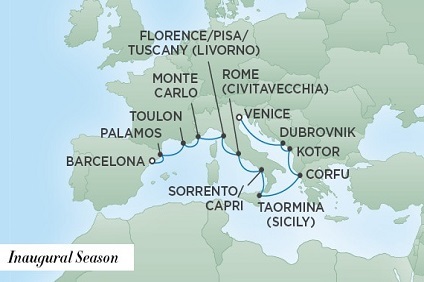 12 Night Cruise sailing from Venice to Barcelona aboard Seven Seas Splendor. 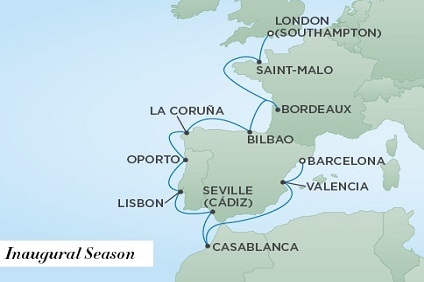 14 Night Cruise sailing from Barcelona to Southampton aboard Seven Seas Splendor. LAYOUT: Private Balcony - Among the Largest at Sea 2 Spacious Bedrooms Spacious Living Room With Sitting Area 2 1/2 Marble and Stone Detailed Bathrooms Private In-suite Spa with Sauna, Steam Room and Jetted Tub 3 Walk-in Closets, 2 Safes HIGHLIGHTS: FREE 1-Night Pre-Cruise Hotel Package Including: - FREE Ground Transfers - FREE Breakfast - FREE Porterage FREE Unlimited WiFi includes up to four logins, four devices, per suite* FREE Personal Car and Guide to Explore Ashore* FREE Unlimited In-Suite Spa Services* FREE Unlimited Laundry and Dry Cleaning* Personal Butler Luxurious Bath Amenities Daily Canapés Personalized In-Suite Full-Liquor Bar Set-Up Priority boarding on embarkation day with suite access at Noon Interactive Flat-Screen Television and Direct-Dial Satellite Phone Vanity and Hair Dryer Regent Plush Bathrobes and Slippers Priority Online Shore Excursions and Dining Reservations 10% Discount on Premium Wine and Liquor 5% Discount on Regent Choice Shore Excursions, Hotel and Land Programs DIMENSIONS: Suite: 3,026 ft2 (281.1 m2) Balcony: 1,417 ft2 (131.6 m2) Suite measurements are approximate, and furniture placement may be different than as depicted in photographs. Driver may serve as the personalized guide or another guide will be provided. In-Suite Spa Service is subject to availability based on the treatment. Private Sedan transfers apply per household up to 100 miles. Credit will not be provided if the services are declined.